Hop-Syn G2 is a heavy gauge synthetic paper that is a superior alternative to conventional plastic. 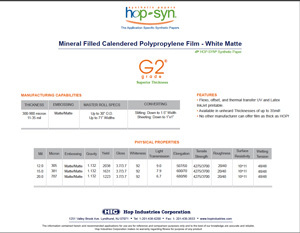 Our G2 grade is a single layered substrate manufactured by calender from a unique mixture of calcium carbonate and polypropylene resin. Our G2 grade is made with added whitening agents to improve its sheet brightness and opacity up to 93%. With a high dyne level and smooth matte finish, our G2 grade has the printing performance that you would expect from a fine offset paper but with the weather resistant properties of plastic. With Hop-Syn G2 you can avoid the difficulty of printing on plastic and bypass the added cost of lamination up to a 35mil thickness.